Less than a year after passing the 9,000 cars and the 30% archived threshold we are proud to announce having reached another milestone. As of this month we are in the 5 digit range and now hold data for more than 10,000 8-series cars in the 8Coupe archives. Only a few hundred cars need to be added to achieve yet another long term goal - 1/3 of the entire production. We hope to be able to surpass this number during Summer 2014. By now between 50 and near 60% of the last 4 model years (1996-1999) are in the archive. The strongest production years 1990 and 1991 remain well below that percentage (ca. 25% in the archive). 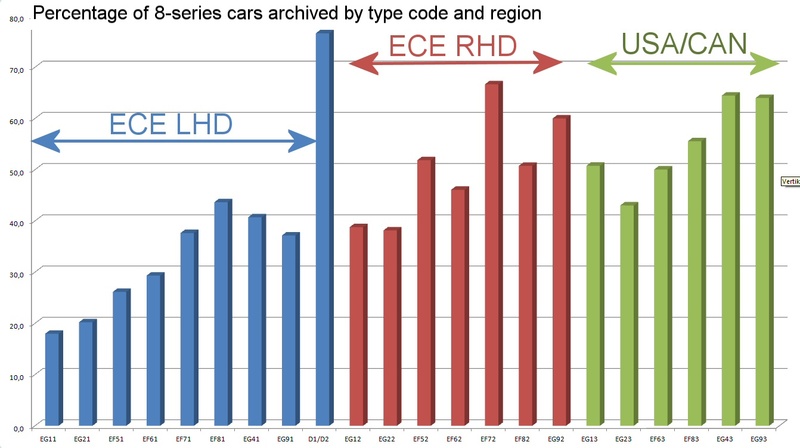 Comparing typecodes and delivery regions respectively it becomes clear that the lion´s share of cars still missing are ECE spec M70´s. Until today we have 18% (EG11 ECE M70 6 sp.) and 20% (EG21 ECE M70 auto) archived, totalling 2910 out of 14700 cars. By mid-May 2014 more than 75% of the (worldwide) 8-series cars are 20 years and older. Due to the advanced age of the majority of the cars to date not archived, chances to increase the mentioned figures significantly are getting smaller by the day. North American and UK RHD figures are well above those for the rest of the world. This is in large parts due to the different approach towards car advertising (VIN included) or registration features that accompany a car "for life" and the availability of online sources to evaluate such. Whenever a car´s VIN cannot be taken from either the advertisement or the registration information we have to rely on visuals or the cooperation of the advertising party to make a valid identification. The 8coupe archives will continue to grow, albeit slower than in the past few years. There is no immediate target following the 33.3% milestone due this year. Chances to archive 40% and maybe even 50% of the entire production do exist. Based on USA "salvage" figures it seems safe to assume that in this 25th year of the E31 in excess of 75% of the entire production is still around. Based on the archives´s growth rate we hope to reach the 11,000 and 12,000 cars archived milestones in 2015/2016 and ca. 2017/2018 respectively.